FURTHER RESOLVED, That (an optional additional recommendation; if not used, end the previous “resolved” clause with a period). A “Further Resolved” clause is not necessarily needed; it is included here as an example. SECTION 1. State the new policy in a brief declarative sentence, or in as few sentences as possible. SECTION 2. Define any unclear terms inherent to the issue, or go into further detail. with the specific enforcement mechanism. SECTION 4. Indicate the implementation date/timeframe. SECTION 5. If necessary, state that all other laws in conflict with this new policy are hereby declared null and void. Please note: a bill neither requires five sections, nor inclusion of the items above; they are included as examples; students should simply arrange sections in a logical order. Most legislation should have a domestic focus that the U.S Congress would have jurisdiction over, taking the form of a bill. A bill establishes details behind how a particular law must work, including when it takes effect, how much tax levy would be appropriated (if applicable), how infractions/violations will be dealt with, etc. A bill may answer the who, what, when, where – and most specifically how – but it will never answer “why.” Legislators explain rationale behind bills in their speeches, and how a bill implements its solution can spark deeper, more meaningful debate. Since bills attempt to solve problems faced by our country, brainstorming those areas is a great place to start. Students should be mindful of how controversial an issue is, to ensure two-sided debate. Next, students should think about exactly what the U.S. Congress has jurisdiction over. Since the Executive Branch runs most of the agencies that enforce federal laws, understanding those helps; for more information, visit www.usa.gov/Agencies/Federal/ Executive.shtml. While foreign affairs often fall under the jurisdiction of the Executive Branch, funding efforts such as USAID can have an impact on the success or failure of United States involvement in other countries, and therefore, can be framed as a bill. Inspiration for legislative ideas can be found at: thomas.loc.gov. Writing an effective bill involves more time and research than researching one written by someone else. A student must ask her/himself what the legislation does, who is involved (government agencies), where it happens, when it is feasible to take place and how much time is needed for implementation, and how it should be carried out (a plan of action). All of these questions must be answered in writing the sections of the bill, with thoughtful consideration as to how thoroughly each section explains its plank of implementing the overall bill’s plan of action. Constitution). Resolutions lack the force of law, and never establish enforcement. Appropriate topics exhibit seriousness of purpose. The action proposed should be realistic, and such that the actual United States Congress might debate it. Topics should be debatable, meaning substantive argumentation exists on both sides. Legislation should be typed and double-spaced with line numbers, not exceeding one page. Capitalizing words “WHEREAS” and “RESOLVED” in resolutions, and “SECTION” in bills, as well as inverse-indenting each clause or section helps to distinguish between ideas and concepts. These samples show proper formatting. In the resolution, note the semicolon, and how it precedes the word “and” at the end of each “whereas” clause, and the phrase “now, therefore, be it” at the end of the last “whereas” clause. Templates for drafting legislation, and sample legislation may be downloaded from congressionaldebate.org. Researching the Docket: the tournament will post a docket of legislation. Schools are encouraged to brainstorm affirmative and negative arguments and find supporting evidence through research. Students should have a firm working knowledge of issues in the docket, but should not write word-for-word speeches ahead of time; rather, they should be prepared to dynamically respond to arguments given by peers at the tournament. Students should act the part, being the senator or representative, who weighs the needs of the theoretical constituents they represent. This includes speaking as a legislator would talk, and acting genuinely nice to other delegates. If students think of the purpose of Congress as serving a higher need of solving problems in our society (rather than as a debate competition), they will take it more seriously. Humor is okay, but shouldn’t be the emphasis of speaking or conduct. Students should dress the part: professional legislators wear business attire. Dress shoes are highly recommended with restraint toward tasteful accessories that would not distract an audience. Chamber Opening Business: Upon arrival, students are assigned to chambers, labeled as a “Senate” or “House (of Representatives),” where they would be assigned the appropriate courtesy title (Senator or Representative). A seating chart will be established, which facilitates easier identification by student presiding officers and judges. Stand and say “I rise to a point of order.” After the presiding officer says “state your point,” reply by stating what you believe has been done wrong, and then site down. Until the presiding officer – who may first confer with the parliamentarian – answers, neither you nor any other member may say anything. If you still believe the presiding officer is wrong and the mistake should be corrected, rise and say “I appeal the decision of the chair.” This motion requires a second. There is no discussion, but the legislator making the motion may briefly explain why he/she thinks the presiding officer should be overruled. The presiding officer then takes the vote by saying “those voting to sustain the presiding officer…” and “those voting to overrule the presiding officer…” Once the vote has been taken and the results announced, the decision is irrevocable and no further discussion is permitted on the manner. Do not abuse the motion for previous question. The reason it requires a two-thirds vote is it limits the free expression rights of legislators in the chamber. While majority rules for actions an assembly takes, the rights of minority to engage their peers in discourse is the very foundation of our democracy. When a legislator moves the previous question immediately after speaking, it sends the message “I gave a speech, and I don’t care if others wish to have the same opportunity.” Limiting other contestants’ opportunities to engage in debate by suspending rules to alter the agenda, or by laying legislation on the table is even worse, and should be discouraged by presiding officers. If debate truly gets one-sided and repetitive, that is the only true purpose of the Previous Question. iv. Before precedence is established, the presiding officer should explain his/her recognition process and it must be fair, consistent and justifiable. v. Precedence/recency resets for each session. b. A student may be recognized to speak as often as possible and may speak more than once on the same issue. c. A speaker may yield time on the floor during debate (for questions or clarifications) but that speaker will remain in control of his/her three minutes (see #4 below regarding questioning). 2. Speeches introducing legislation and the first negative/opposition speech are allotted up to three minutes, followed by two minutes of questioning by other delegates. A student from the school who wrote the legislation gets the privilege of recognition (called authorship), regardless of recency; otherwise the presiding IDEA/NJFL Middle School National Tournament Manual 19 officer may recognize a “sponsor” from the chamber, provided this recognition follows the recency guidelines above. Regardless, this speech of introduction must be followed by two minutes of questions. Should no student seek recognition for the authorship/sponsorship, the chamber should move to lay the legislation on the table until such time that a student is prepared to introduce it. 3. Following the first two speeches on legislation, the presiding officer will alternately recognize affirmative and negative speakers, who will address the chamber for up to three minutes followed by one minute of questioning by other delegates. If no one wishes to oppose the preceding speaker, the presiding officer may recognize a speaker upholding the same side. When no one seeks the floor for debate, the presiding officer may ask the chamber if they are “ready for the question,” at which point, if there is no objection, voting may commence on the legislation itself. There is no “minimum cycle” rule, however, if debate gets “one-sided,” the chamber may decide to move the previous question. a. In the event a student speaks on the wrong side called for by the presiding officer and the error is not caught, the speaker shall be scored and the speech shall count in recency, but the speaker must be penalized at least three points for not paying close attention to the flow of debate. b. In the event a student speaks on an item of legislation not currently being debated, said speech shall count in recency, but zero points shall be awarded. 4. The presiding officer fairly and equitably recognizes members to ask questions following each speech. It is unnecessary for speakers to state they yield to questions, because the rules specify the period for questioning. 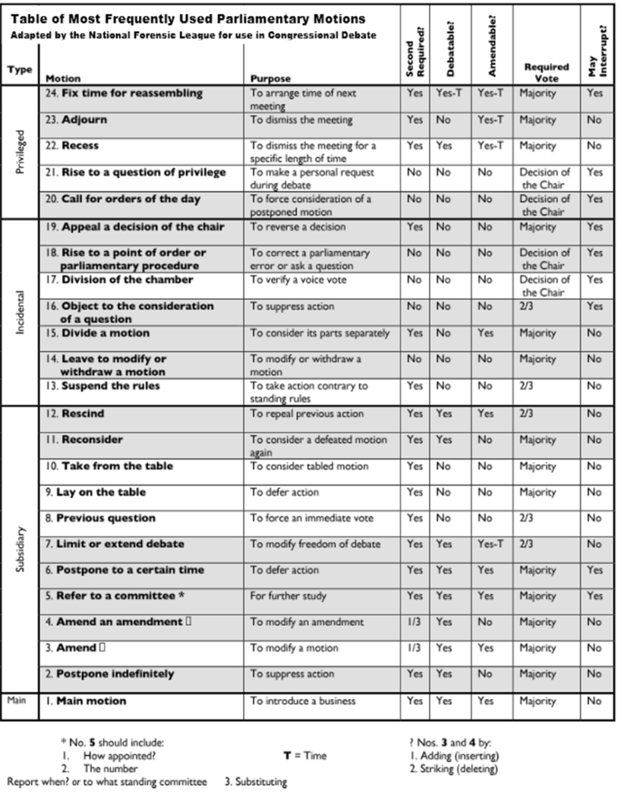 The presiding officer – who has a seating chart – controls calling on questioners. S/he starts timing questioning periods when s/he has recognized the first questioner, and keeps the clock running continuously until the time has lapsed. Speakers are encouraged to ask brief questions, and may only ask one question at a time (two part/multiple-part questions are not allowed, since they monopolize time and disallow others to ask their questions). There is no formal “permission to preface,” however, presiding officers should discourage students from making statements as part of questioning, since that is an abusive use of the limited time available. 5. The presiding officer will pause briefly between speeches to recognize any motions from the floor, however, he/she should not call for motions (at the beginning of a session, the presiding officer should remind members to seek his/her attention between speeches). 6. Amendments must be presented to the presiding officer in writing, with specific references to lines and clauses that change. This must be done in advance of moving to amend. b. A legislator can only move to amend between speeches. Once that motion is made, the presiding officer will read the proposed amendment aloud and call for a second by one-third of those members present, unless he/she rules it dilatory. c. Should students wish to speak on the proposed amendment, the presiding officer will recognize them as per recency, and the speech will be counted toward their total, accordingly. d. Simply proposing an amendment does not guarantee an “author/sponsor” speech, and any speeches on amendments are followed by the normal one minute of questioning. e. Amendments are considered neutral and do not constitute an affirmative or negative speech on the original legislation. f. If there are no speakers or the previous question is moved, the chamber may vote on a proposed amendment without debating it. a. Final votes on legislation, amendments, and motions to appeal the chair require a recorded vote. b. Voice voting is acceptable for all other votes, but a recorded vote must be taken if any one legislator calls for a division of the chamber. c. A roll call vote is permitted if such a request is agreed to by 1/5 of the chamber. 8. Ask permission to leave and enter the chamber when it is in session (move a personal privilege). However, do not interrupt a speaker who is addressing the chamber. 9. Since the rules above ensure fairness for competition, they may not be suspended; the presiding officer should rule such motions out of order. Speeches in Congressional Debate should be clearly and logically organized, and characterized by depth of thought and development of ideas, supported by a variety of credible quantitative (statistical) and qualitative (testimony) evidence analyzed effectively to draw conclusions. Compelling language, an attention-grabbing introduction and clear transitions should clearly establish the speaker’s purpose and give perspective to the issue’s significance. The speaker should contribute to the spontaneity of debate, effectively synthesizing response and refutation of previous ideas with new arguments. If the speaker fields questions, he/she should respond with confidence and clarity. The speaker should have polished, deliberate, crisp and confident vocal control and physical poise. Delivery should be extemporaneous, with few errors in pronunciation. Eye contact should meaningful and consistent. Judges award 1-6 points for each individual speech a student gives, accounting for the student’s answers to questions. It is entirely acceptable to award 6 points if the judge feels the student met the burdens of argument and the standards above. If the students fell short of expectations, the judge may deduct points as s/he sees fit. Scores of fewer than three (3) points are rarely encouraged, and should be reserved for such circumstances as abusive language, a degrading personal attack on another legislator, or for a speech that is extremely brief (less than 45 seconds) or delivered without purpose or dignity for the cause demanded by the legislation. Substantial written comments and description of specific incidents should accompany such scores. At the end of a session, judges will also rank students in order of best to “least best,” accounting for all students’ overall participation and conduct during the session.